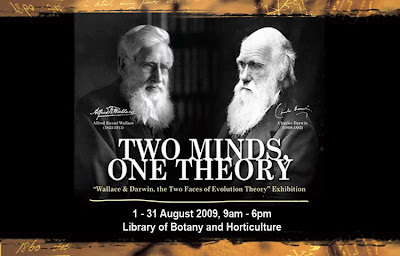 As part of the year-long events celebrating the 150th Anniversary of the Singapore Botanic Gardens, the exhibition on the Evolution Theory, first discussed by Charles Darwin and his lesser-known counterpart, Alfred Russel Wallace is currently being featured at the Botany Centre of the SBG. 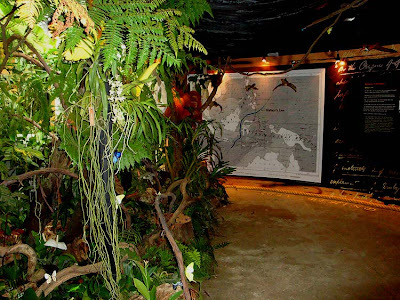 The exhibition discusses Natural Selection and the Theory of Evolution as first postulated by the two intellectuals after spending a lot of time circumnavigating the globe and observing a profusion and diversity of life forms. The search for an explanation to understand long-term organic change brought them to many parts of the world then unfamiliar with the western civilisation. Between the two intellectuals, A.R. 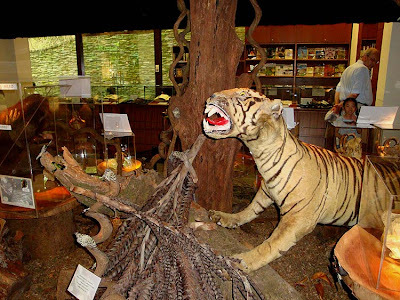 Wallace spent many years in the Far East, collecting thousands of specimens in his research. 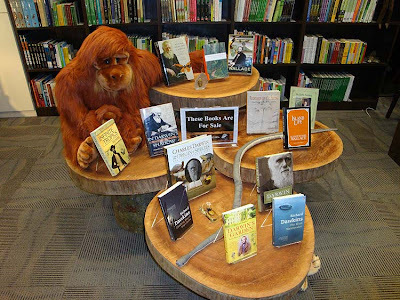 In 1869, he published his landmark work, the Malay Archipelago, elaborating his theory of evolution. Wallace also made significant contributions to biogeography when he linked the geographical distribution of animals and plants to the regions' geological history. 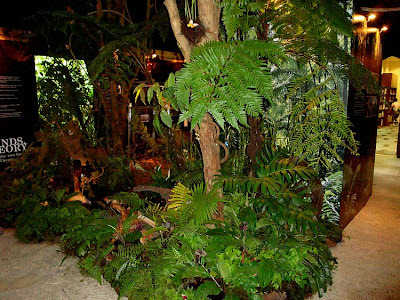 Whilst in Singapore, Wallace explored Bukit Timah collected 700 species of beetles. The incredible productivity at Bukit Timah is an illustration that we live in a region with one of the richest biodiversities in the world. 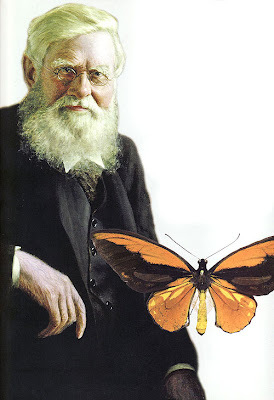 Amongst his collections, Wallace also collected numerous species of butterflies in the region. 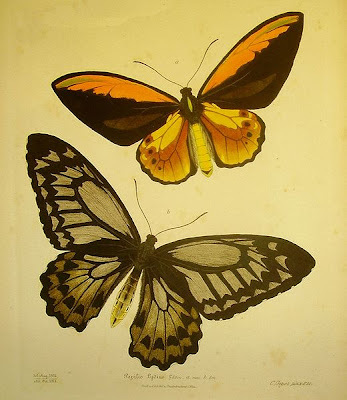 As a collector and a scientist, Wallace wrote in his book, the Malay Archipelago, a rather graphic and emotional account after successfully capturing the spectacular Wallace's Golden Birdwing (Ornithoptera croesus) at Batchian, Moluccas in 1858. He noted that "On taking it out of my net and opening the glorious wings, my heart began to beat violently, the blood rushed to my head, and I felt much more like fainting than I have done when in apprehension of immediate death. I had a headache for the rest of the day. So great was the excitement produced by what will appear to most people a very inadequate cause". Wallace is also credited with describing many butterfly species for the first time, and amongst those was the famous Rajah Brooke's Birdwing (Trogonoptera brookiana) which Wallace first described in 1855. 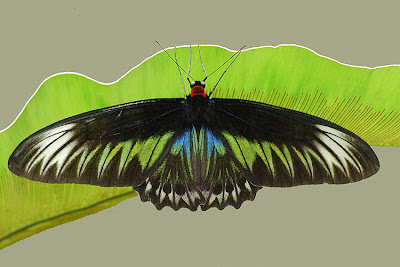 Wallace is credited with first describing the famous Rajah Brooke's Birdwing in 1855 after a specimen was given to him by the then governor of Sarawak, James Brooke. In recognition of his work, many later researchers also paid tribute to Wallace by naming new organisms after him. Amongst butterflies, one famous local subspecies of the Blue Pansy is the most well-known. 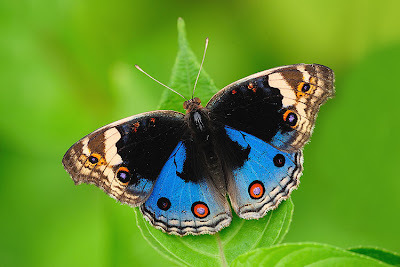 The Blue Pansy (Junonia orithya wallacei) had the subspecies named after Wallace by the collecter Distant in 1883. 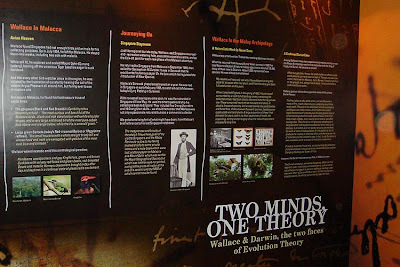 The SBG Exhibition traces some of Wallace's journey in the Far East, and explains some of his theories and findings. Interestingly, he is also credited with giving the Durian, the name "King Of Fruits"! He was a converted durian eater, and actually enjoys eating the fruit that many westerners avoid. Some of Wallace's theories on natural selection, displayed in butterflies, are mimicry, camouflage, masquerade, sexual dimorphism and so on, can be seen in Singapore's butterflies. 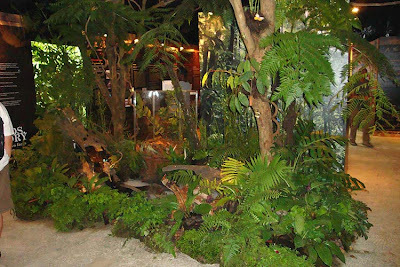 At the SBG exhibition there are also many specimens of butterflies around the displays and nature dioramas. 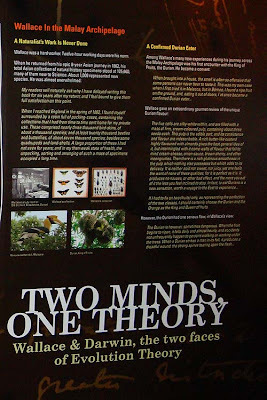 At the Launch of the Exhibition, I also gave a short talk on Natural Selection, adaptation and survival strategies with particular reference to butterflies. 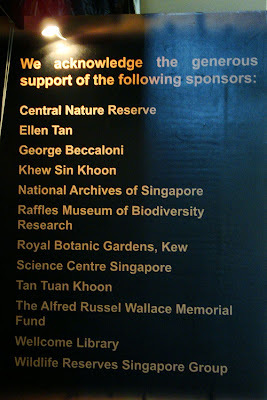 I was honoured to have, amongst the distinguished guests in the audience, personalities like Minister George Yeo, Professor Tommy Koh and nature guru, Ms Ilsa Sharp. 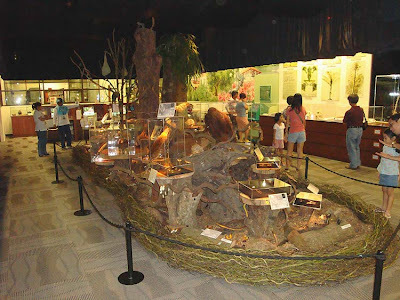 The exhibition lasts until 31 Aug 2009, and for those who have yet to catch this exhibition in tribute to Alfred Russel Wallace, you have about a week more to visit the display at the SBG Botany Centre.